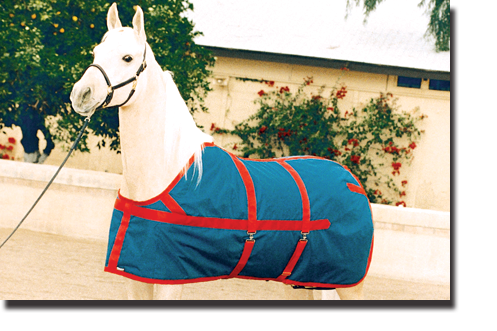 The Equi-Lite Blanket is a lighter weight version of our popular Show Coat winter blanket, with 2/3 the insulation value, for milder climates or heated barns. 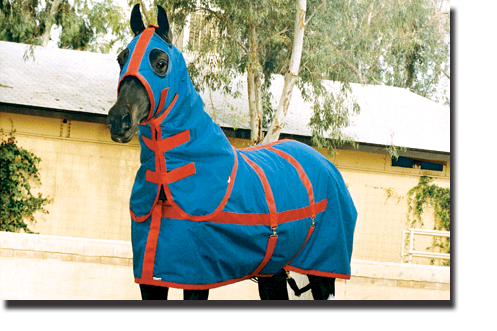 The Equi-Lite Blanket and Hood contain a lighter Thinsulate™ and quilted smooth inner lining. The shell is constructed of a tough yet more breathable 500 Denier Dupont Cordura Nylon. These features insure comfort, protection and warmth without overheating or sweating. Available with open or closed front. 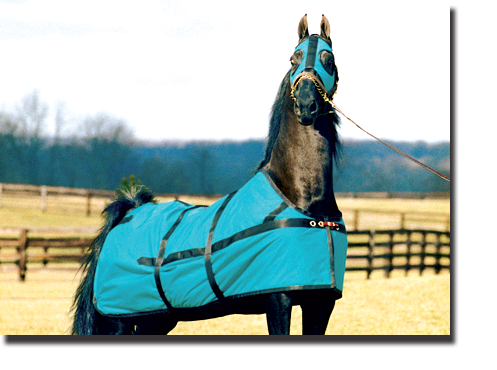 The RaDon Equi-Lite Hood comes with optional heavy duty zipper or velco fasteners. A slick Arctic Nyl lining runs along the top of the neck to preserve and protect the mane. The optional Scotch Hood (pictured) works great for those horses that cannot wear a full neck hood.